Attention weary scholars: by the powers vested in The School Company and Rapunzel, you get an extra week of winter vacation. At least, that’s what the extremely official letter pictured above tells us. 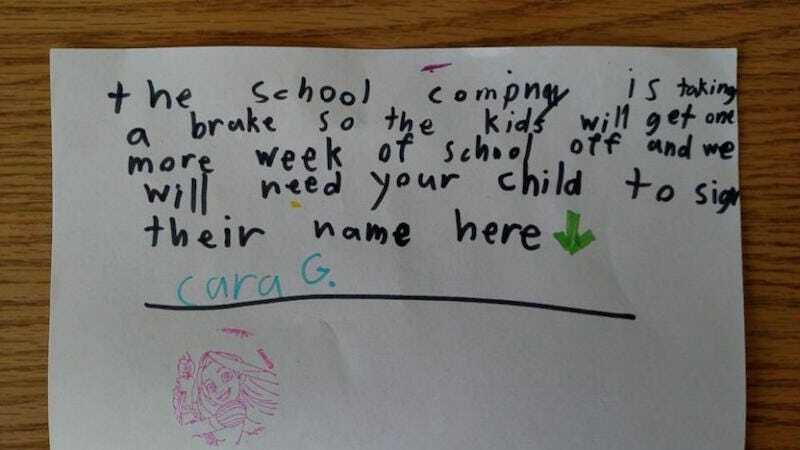 The signature on the school mailing belongs to one Cara Grimard, age 7, who, Yahoo! News reports, “wrote a mock letter and told [her father] it came in the mail.” Her father, Terry Grimard of Slater, Iowa, was understandably amused and posted a picture of his daughter’s handiwork on Reddit. It has so far received 2.5 million views. I’m pretty impressed by the sly substitution of a student signature for the usual parental sign off. Cara G. knows what’s up, and she covered all her bases. But alas, neither a Rapunzel stamp—imposing though it is—nor internet fame could prevent the inevitable. Here’s hoping this enterprising kiddo had a good day back at school.